We all need to indulge once in a while, and few things are better to indulge in than junk food. Junk Food lights up the pleasure centres in our brain and is actually addictive like many illegal drugs or cigarettes. Are there any positive effects of junk food? Turns out, for some of it, there are a couple benefits. Here’s our healthy junk food: Surprising Junk Foods That Are Actually Good For You. Tomato ketchup contains a hefty amount of an antioxidant called lycopene. Studies suggest this antioxidant can lower your risk for heart disease. Organic ketchup can contain up to 60% more than it’s conventional counterparts. Red Meat has been blamed for almost every health boogeyman one can imagine, from heart attacks to cancer. However, more recent studies have shown that the there is not enough data to support a clear connection between eating red meat and things like cancer, stroke and heart disease. There’s also no consistent evidence showing that eating red meat greatly raises cholesterol levels. Red meat does, however, for sure, contain one of the most easily absorbed forms of Vitamin D, which is good for bone and breast health. It also contains Zinc, which is far more easily absorbed than the iron in dark green veggies. Grass fed beef has a high content of something called “conjugated linoleic acid,” which can aid in fat loss. 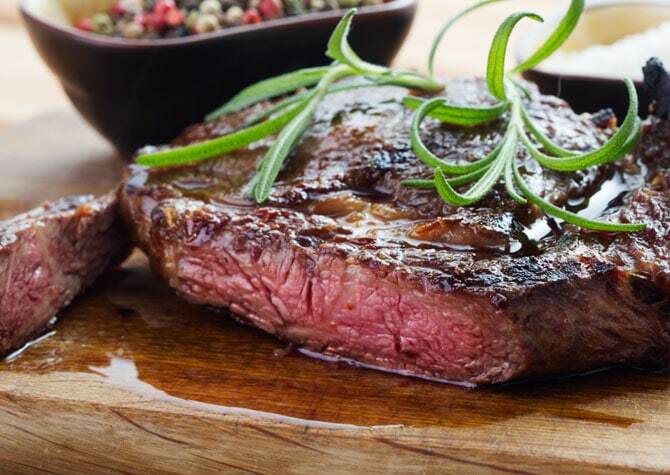 So have a steak if that’s what you’re craving because it may be just what your body needs. If you’ve ever felt guilty for enjoying a heaping spoon from the jar, don’t feel bad. Peanut Butter is full of healthy fats, and some studies show it can help prevent gallstones, certain kinds of cancer, and even heart disease. Just try to find all natural peanut butter without sugar or added oils for a healthier option. Pizza can actually be really good for you, depending on the quality and how you top it. A slice of veggie pizza with tomato sauce and cheese is loaded with vitamins and calcium. If you make your own pizza from scratch, you can use the best quality ingredients and make it with whole wheat crust, top it with lots of veggies, making it a healthy option for dinner. Wine is good for your heart, having a glass of wine a few times a week, not getting sloshed on the whole bottle. It contains a chemical called Resveratrol (found in grape skins), which studies suggest can help protect against heart disease, type 2 diabetes, and even Alzheimer’s. Much like red meat, egg yolks have fallen to the “CHOLESTEROL AND FAT = BAD” stigma that has been pushed for so many years. But researchers are finding more and more that patients hospitalized for heart attacks often have “normal” cholesterol levels. In addition to that, due to changes in diet for most commercial egg-laying hens, eggs actually have less cholesterol than a even a decade ago. Cholesterol is actually pretty essential to keeping our body running, so getting it from good sources like eggs, rather than over-processed industrialized vegetable oils is a good idea. Plus, again, it’s full of protein and low-carb, so for many on restrictive diets, they’re a perfect way to start the day. Yes, bacon. Aside from being packed with protein, making a good low-carb snack, bacon actually has LESS saturated fat than many cuts of beef. It also contains a nutrient call choline which helps keep our brain healthy and may even prevent mental diseases like Alzheimer’s. The Omega-3 fatty acids as well as the choline in bacon can also help prevent heart disease. Yes, prevent. With bacon. At least, butter from grass fed cows, like Kerrygold. Butter from cows that eat grass and butter from cows that eat processed grain and corn is vastly different, and grass fed butter contains all sorts of things that are good for your body and brain, like vitamin K2 (which de-calcifies arteries) and a Omega 3 fatty acids. Believe it or not, yeah, pork rinds are actually a healthy junk food alternative to a bag of potato chips. One ounce provides 17 grams of protein, which is 9 times more than in a serving of ye olde potato chips. Most of the fat is Oleic Acid, which is a healthy fat like olive oil, and one of the other fats stearic acid doesn’t raise cholesterol.